Donald Stone Scheu served in the U.S. Navy during WWII, along with three of his brothers, one of whom was my paternal grandfather. My grandfather served in the Coast Guard, and in addition to sailing off the coast of south Georgia looking for submarines, he was off the coast of Normandy during D-Day. These breezy and often humorous newsletters from home, which I’m sure were eagerly awaited in the days before Facebook and Skype, somehow ended up in my care after my grandfather passed away. 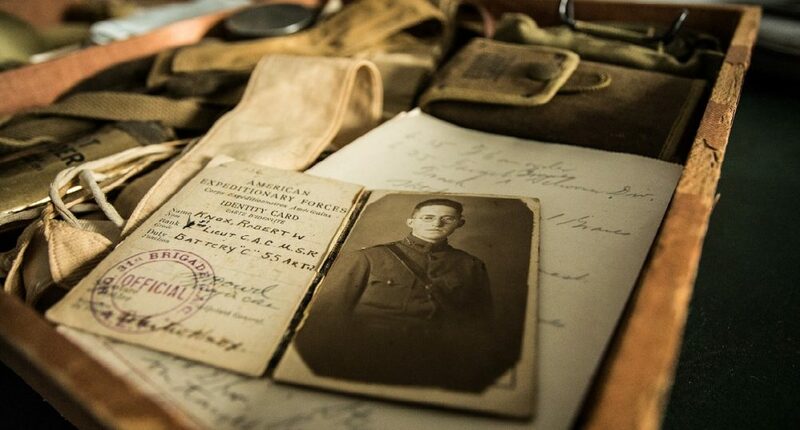 This cardboard box, thick with letters all typed on airmail weight paper after five years of war, brings the family I was too young to ever meet into sharp focus – along with their personalities, their joy and humor and their love for each other. In addition to the gossip and news from home and carefully written memories from around the “family punch bowl,” the box contains the original telegram that informed my great-grandmother that her son Don, my great uncle, was missing in the Pacific. Having not yet married or had children, he had volunteered for a submarine assignment in the Pacific. He served aboard the USS Scorpion I (SS-278), which was supposedly lost on February 1, 1944. It is assumed the submarine hit a Japanese mine. Having two young sons myself now, the thought of my great-grandmother’s grief fills me with overwhelming terror. Years ago, my grandmother told me my great-grandmother once went on a boat trip to where the Navy believed the Scorpion had been lost. She threw Don’s class ring from the Naval Academy overboard into the Pacific, to give herself some closure. I always wondered why she didn’t keep it, as a reminder. And then I had children of my own, and I know now, the ring was nothing compared to the boy she had birthed, hugged, disciplined, fed and loved. The deep eyes she sung to as she held him before bed, the little hand that had grasped her fingers. The wet curls she kissed and the tiny head she had tucked under her chin. The first stumbling words he spoke. 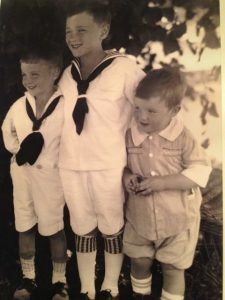 When he ran to her, arms outstretched, hollering, “Mama.” Maybe even the memory of the moment when this photo was taken – cajoling three busy young boys to stand still, perfectly still – stand still and smile – “Smile! Boys! Smile!” – just as I yell at my own children today. Surely these sweet things known only to a mother stayed etched in her mind, kept her holding on, helped her from shattering. On Memorial Day, I remember my great uncle, I share his story with my older children to give them a sense of family history, a sense of place, a sense of who they have come from and where those family members are now. My father, named for his father’s lost brother, always says, “Thanks for remembering Uncle Don today,” and I say a prayer for my brother, a Navy pilot, who always flies with Uncle Don’s Silver Star in his flight suit pocket. But mostly, I hold my boys close, I squeeze them until they struggle to get away from me. I think of my great-grandmother, and her grief. And the grief of all the mothers whose sons and daughters never came home. They are in my prayers. Left to right: Don, William and Robert (my grandfather). Lt. Commander Donald S. Scheu is a recipient of the Silver Star, Bronze Star and Purple Heart. Meg Sacks is the mother of four – including twins. 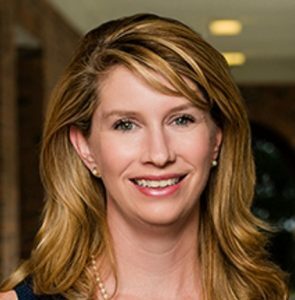 She is an office mama with 17 years of corporate communications experience and is also a contributor to Jacksonville Moms Blog.